﻿ Faroe Islands 0-6 Portugal. Cheaper by the dozen! 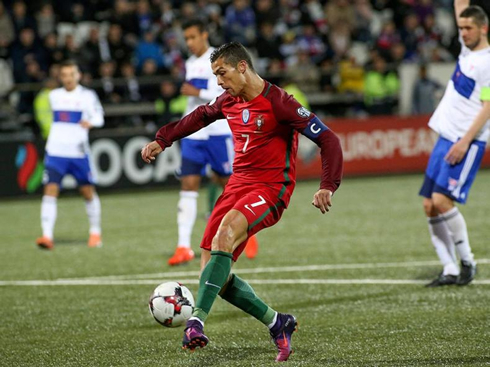 10.10.2016 » Faroe Islands 0-6 Portugal. Cheaper by the dozen! Portugal earned their second win in a row in this international break and the result was exactly the same as their previous one. The Portuguese National Team ran over the Faroe Islands in a 6-0 win and are now second in their qualifying group, behind Switzerland. The international break couldn't have gone better for the Portuguese National Team and their last victim were the Faroe Islands, who got beaten 6-0 this Monday night. Cristiano Ronaldo scored another goal for his country but this time the spotlight was on André Silva, the 20-year old striker who netted his first hat-trick wearing the Portuguese colors. João Moutinho and Cancelo scored the remaining goals in this game and the chase to Switzerland on the top of the group promises a good fight in the upcoming months. Fernando Santos opted for not changing a lot in his starting lineup coming off a convincing 6-0 win against Andorra and the receipt seems to have resulted in the same outcome, this time in a 6-0 victory over the Faroe Islands. Portugal took the lead early in the first half, with the new jewel of the crown, André Silva, converting his 1-on-1 chance to put his side in front. Ten minutes later, he added a second to his name, this time from a header near the penalty-kick spot. He would still find time to complete his first professional hat-trick in his career, when he scored from a rebound following a strong strike from Cancelo. The 3-0 score at the half-time left no questions about who would come out with the 3 points tonight, but there were still 45 minutes left to be played and there were several players also wanting to leave their mark in this game. One of those was Cristiano Ronaldo, who scored in his second consecutive game for the Portuguese National Team and increased his side lead to 4 goals. It all came off a good passing combination between João Mário and Ronaldo, with the Real Madrid forward finishing off with a powerful left-footed strike. That's 5 goals in 2 games for the Portuguese captain. The game would drag on in the remaining minutes and we would only see more goals in added time. Fisrt, João Moutinho scored from outside the box, after curling the ball brilliantly to make it 0-5 for Portugal. The final scored was set by João Cancelo, who received a perfect assist from Gélson Martins that allowed him to go 1-on-1 with the opponent's goalkeeper. 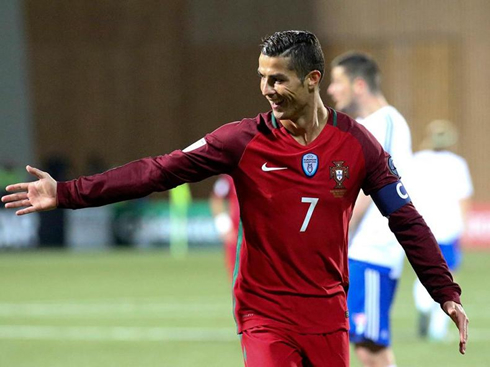 There's more international action only in November now, as Portugal receives Latvia on the 13th. Attackers: Cristiano Ronaldo, André Silva. Cristiano Ronaldo next game is a La Liga fixture for Real Madrid on October 15 of 2016, against Betis. You can watch Juventus live stream, Betis vs Real Madrid, Colombia vs Uruguay, Slovenia vs England, Slovakia vs Scotland, and Germany vs Northern Ireland, all matches provided from our soccer live game pages.